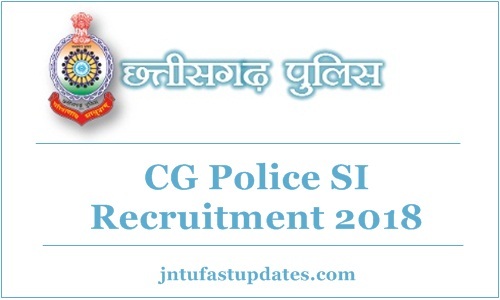 CG Police SI Recruitment 2018: Chhattisgarh Police Department has released the notification for 655 Sub Inspector, Subedar & Platoon Commander Posts. Candidates aspiring to become police sub-inspector in the state of Chhattisgarh can apply for the SI posts from 24th August to 16th September. Candidates keenly waiting for the Chhattisgarh SI recruitment notification can proceed to apply through online @ cgpolice.gov.in. aspirants seeking to get Chhattisgarh Government jobs and having suitable eligibility for the announced posts can utilize this opportunity and prove themselves to get the police jobs in Chhattisgarh. The Chhattisgarh SI and Platoon Notification PDF were accessible on CG Police official website. Candidates can download it observe more details from it. Chhattisgarh Police Department is the government organization that works for various government aids. It recruits the suitable candidates into various government posts. Many of the government organizations associated with Chhattisgarh Police Department to hire the suitable employees. The CG announces various job notifications annually. The CG Police Department has now come up with 655 Sub Inspector Computer, SI Radio and SI Documents Specialist, Platoon Commander, Subedar and SI Finger Prints Posts. Interested and eligible candidates can apply for Chhattisgarh SI and Commander posts from 24th August to 16th September. Candidates keenly waiting for the Chhattisgarh SI recruitment notification can proceed to. Candidates must have the minimum educational qualification of Graduate Degree. Candidates willing to apply for Chhattisgarh Police SI posts can check more details from the CG Police SI Notification 2018 PDF. Candidates can check brief details from the following. Candidates belong to the reservation category will get the benefits of age relaxation as per norms. Selected candidates will get a good pay scale of Rs 35,400 per month. Interested and eligible aspirants can apply through Chhattisgarh Police Department official portal, cgpolice.gov.in in between 24th August to 16th September. Visit the CG Police Department portal to download CG SI notification PDF and to apply for the announced posts as well.